If you live in a four season climate, making the most of your outdoor space when weather permits is usually a high priority. However, the elements and pesky insects can often interfere with your outdoor plans. If you want to make better use of your porch, deck or patio, you might want to consider enclosing it, but how do you know what enclosure is the best option for you? 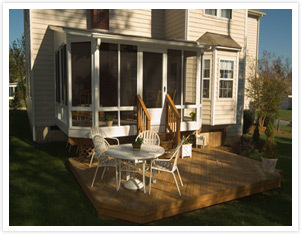 How is a Screened Porch Different from a Sunroom? Protection from Cold and Heat - Somewhat but does not include central heating and cooling. Portable units can be used. Protected living spaces that blur the line between outdoor and indoor living are extremely popular because people love that feeling of being outdoors and connected to nature, minus inconveniences like cold winds, mosquitoes and glaring sun. When you consider enclosures, the first and simplest option is a screened porch: You take an existing porch and simply add screening around the perimeter. You are still intimately connected with nature and if you choose black aluminum screening, you will hardly notice the barrier between yourself and the great outdoors. However, a screened porch is only comfortable when the weather is neither too cold nor too hot to enjoy it and blowing rain may prevent usage. If you want to extend the outdoor season, you may want to consider a three season room, sunroom or solarium. A three season room is enclosed with single or double-pane glass, but offers no climate control other than a ceiling fan and you can use it spring, summer and fall, depending on outdoor temperatures. Homeowners can employ portable infrared heaters during late fall and early spring. A sunroom is the next step up: Double-pane glass and fully functioning climate control allows you to enjoy the great outdoors year round, whether it’s freezing or a searing 98 degrees outside. 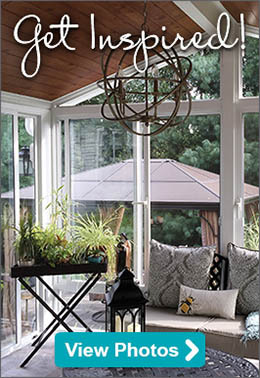 If you add a glass ceiling to a sunroom, you have a solarium which is the ultimate outdoor living space: A solarium lets you feel totally connected to the landscape, the sky, weather and nature but you are protected from the elements year round. So, how do you decide what is best for you? Consider your goals and budget, as well as how you plan to use the space. If you simply want an outdoor space that protects you from the bugs during the warm weather months and is still intimately connected to nature, a screened porch is an excellent option. This also is the least expensive option. A three season room will give you more protection from the elements; it costs a little more but allows you to enjoy the outdoors in all but the coldest months of the year. A sunroom or solarium is a bit pricier because of the added construction, and heating and cooling costs, but they expand your living space year round. When considering your budget for this project, also consider how each option may increase the resale value of your home. Ready to learn more? Schedule your free in-home design estimate or call 800-230-8301 today!